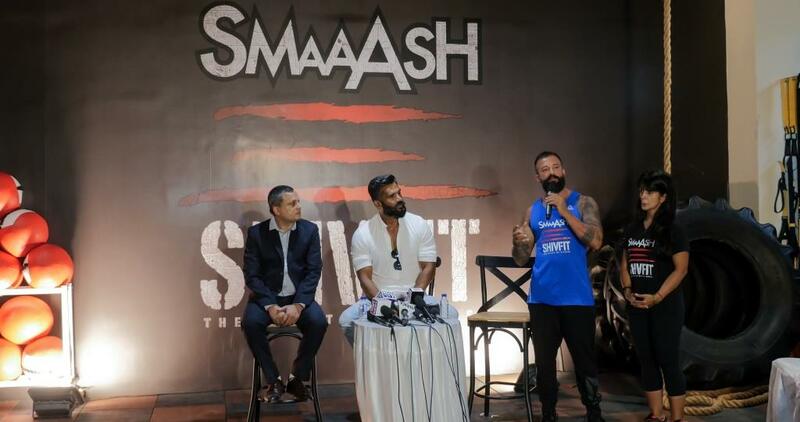 Smaaash Shivfit, a gymnasium that strives to provide you fitness, health, cross functional training and overall physical development was launched at Kamala Mills, Lower Parel by the much acclaimed actor, Sunil Shetty who has appeared in over 110 movies. Smaaash, the gaming and entertainment center has joined hands with celebrity cross functional training expert, Shivoham for this space. The programmes included at Smaaash Shivfit focus on body and mind. This exclusive gymnasium offers various fitness combinations and novel work out regimes for all. Amidst much fanfare, interesting demonstration of several workouts was conducted by Sunil Shetty and the Shivfit team, which was very insightful for everyone present at the launch. This session was followed by Sunil Shetty motivating everyone to adopt fitness as a part of their hectic routines. He gave the audience tips on how to stay fit, the importance of working out and also spoke of benefits of cross functional training. Redefining sports, entertainment and customer engagement with ground-breaking ideas and novel dining concepts, Smaaash has something for everyone. With the introduction of Smaaash Shiv-Fit, it is going to be a one-stop place for recreational and fitness related activities. Smaaash Shivfit is a cross-functional facility run by Shivoham who is the founder of one of India’s first Crossfit boxes. Not only that, there are several specialty classes like Boxing, Pilates, TRX, Yoga, Wrestling and Mind workshops for athletes and corporate amongst many others, for everyone to avail. Breaking away from the ordinary, there are also boot camps, personal training, corporate training and corporate retreats along with a conventional weight training area which offers cardio, machines, free weights, diet consultancy and personal training. “Smaaash truly has something for everyone! Smaaash ShivFit is a unique gym as it is a one-stop for any gym enthusiast- from a homemaker to a corporate employee. It is an all-in-one gym and much more, indeed. It offers tailor-made workout programmes and solutions which are easy to follow and highly effective as well. We have a gymnasium and special box dedicated to cross functional training at Smaaash Shivfit.” said Mr. Ashok Cherian, Chief Marketing Officer at Smaaash. “Ability and age don’t matter in your workout. Located in the heart of the corporate realm, Smaaash Shivfit aims to provide you with a fitness platform. We strive to provide great sessions and work out regimes to all our customers. It is bound to be well-received due to its interesting and crisp foundation of smart workouts.”, said Shivoham who is a celebrity trainer and a staunch believer in working hard to stay fit and giving priority to one’s health. Celebrate the spirit of fitness with Smaaash Shivfit! Launched in Mumbai in 2012, Smaaash is India’s acclaimed, gaming and entertainment center that marries sports, virtual reality, music and dining into a highly immersive, evolved, interactive and innovative social experience for family, friends and children alike. With its current presence in Mumbai, Gurgaon, Hyderabad, Bangalore, Noida and Ludhiana, Smaaash is a virtual reality led entertainment gaming center – vastly credited to its in-house research and production capabilities, head mounted displays are used to produce games such as Walk the Plank, Finger Coaster, Cockpit 360 etc. Smaaash implores the child in you to forget all decorum and joyously revel in an unmatched range of activities ranging from highly interactive sports simulators to many more thrilling and recreational attractions.